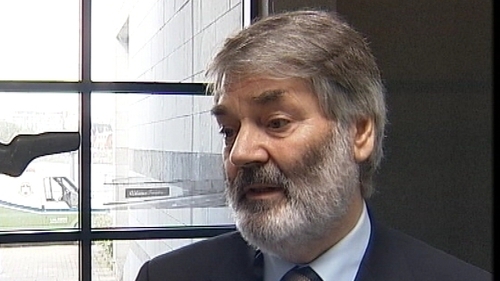 Labour's Proinsias De Rossa is to step down as an MEP for Dublin in February. The 71-year-old issued a statement this afternoon announcing his decision to resign, but did not give a reason for the move. He was elected to the European parliament in 1999 after serving a previous term in the early 1990s. Mr De Rossa served as a Minister for Social Welfare in the Rainbow Government in the 1990s while he was leader of Democratic Left. He has also been a member of The Workers' Party, for whom he was elected to the Dáil in 1989. In a statement today he said: "My work as a public representative for 30 years, and before that my 25 years as a grassroots political activist, has always been motivated by a desire to change society for the better. "I have dedicated all my energies to the pursuit of peace and the elimination of poverty and inequality through peaceful change, and the deepening of democracy." Mr De Rossa will be replaced as MEP for Dublin by councillor Emer Costello. Labour leader Eamon Gilmore described Mr De Rossa as a "passionate, hard-working and dedicated representative of Ireland".